Adam Sandler Gets 4-Minute Standing Ovation at Cannes, Is Oscar Next? Adam Sandler received a four-minute standing ovation (yes, you read that correctly a 4 minute standing ovation) at the Cannes Film Festival on the French Riviera. Sandler has come a long way since nudie magazine day and this is actually his second time gaining praise at Cannes. The first time was 15 years ago for his highly underrated performance in Paul Thomas Anderson's Punch-Drunk Love. The late Roger Ebert even praised Sandler's performance in the movie stating that Sandler had "unexpected depth" and that he has "darkness, obsession, and power." This is all true, so where did that version of Sandler disappear to? If Sunday's standing ovation has anything to say about it, that Sandler is back. The ovation came after a screening of Noah Baumbach's The Meyerowitz Stories, which is competing for a Palm d'Or this year at Cannes, the highest honor given at the event. The movie was recently acquired by Netflix and stars Sandler alongside Ben Stiller, Emma Thompson, and Dustin Hoffman as a dysfunctional family in New York. Baumbach wrote and directed the comedy-drama movie, which is gaining many positive reviews, many heaping praise for Sandler's performance. 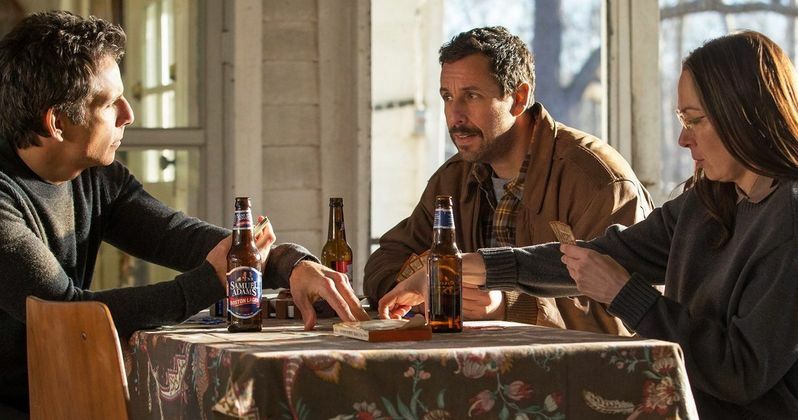 Deadline is reporting that Adam Sandler is the "standout among a cast of standouts" and that it may be too early to tell, but Deadline writer Peter Hammond is claiming that Sandler could be in the running for best actor at Cannes after watching the movie. Hammond explains. "Perhaps the [biggest surprise is] a sentence I thought I might never write: Is Adam Sandler a contender for Best Actor in Cannes?" Now this isn't just coming from Deadline. Vanity Fair, The Hollywood Reporter, Variety, and other major outlets are echoing Deadline's statement. The movie currently has a 93% fresh rating over at Rotten Tomatoes. The Meyerowitz Stories was originally met with boos from the theater when the Netflix logo appeared on screen much like when Netflix's Okja premiered at the festival, due to the recent controversy regarding French movie premiers and the length of time to send the movies to streaming services. Netflix is refusing to open both movies in theaters in France, which in turn angered theater owners and festivalgoers. Unlike Amazon who took the Oscar winning Manchester by the Sea on the festival circuit and theatrical run, Netflix is continuing with their tried and true strategy of bombarding its streaming service with enormous amounts of content. Cannes organizers have announced that starting next year, a movie will not be eligible for the Palm d'Or without a French theatrical run. It's about time for Sandler to see some critical love. He has been a part of twelve live action movies since 2010 and only one of those movies has a Rotten Tomatoes score of over 30%. Hell, even his kids say that they don't like his movies, but that all shouldn't matter. Sandler makes fun movies that he wants to make, you either like them or you don't and he doesn't really seem to care either way.